Please help to fill completed the form and leave us your reviews here ! Hi Mr Kunn, How are you? This is Yumi, I volunteered at SHCC last year Nov-Dec. 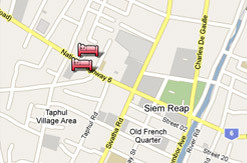 I will be arriving in Siem Reap on 03/07/2012 at 18:30. Can I please book a tuk tuk pick up from airport. I will be volunteering again at SHCC, so I can please book single room with fan and shower for 3 weeks (volunteer rates). Thank you. I stayed at this hotel for 4 nights in September 2015. It was fantastic value, the rooms were lovely, it was very clean, the food was great, a very nice swimming pool & the best thing about the place was the lovely staff. The location was also good. 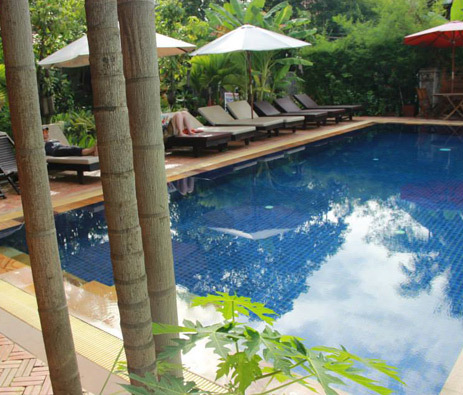 Everytime I visit Siem Reap I stay at Jasmine Lodge. I cannot say enough about both the facilities and the staff there. Mr Kunn, Hak and all the other staff at Jasmine Lodge are wonderful! They are always smiling and happy to see you, returning to Jasmine Lodge is like returning home. Everyone goes out of their way to make you feel welcome and ensure you have the best stay possible. Jasmine Lodge is a one stop shop for everything......tour bookings, booking transport, visa renewals, directions, recommendations, volunteering opportunities whatever your query they will be able to answer it, organise it for you or point you in the right direction, all while ensuring you get the best possible deal. I guarantee they will look after you! There are no hidden costs either..... the wifi really is free, as is the airport pickup, the water, the pool table usage and book exchange. The rooms are nice, the food is amazing, the tuk tuk drivers are the best in town and the hospitality is second to none. You will not find better value for money or more friendly or helpful staff anywhere. And the fact they give so much back to the community makes it even better! The atmosphere at Jasmine is one of family, and you will be made to feel part of it. I for one cannot wait to return! I love Jasmine Lodge. They take care of their guests very well. Very friendly rates and super friendly staff. Thanks to Mr. Kunn and to his nephew Hak and everyone at Jasmine Lodge. Highly-recommended... Next time, I'll go back to Jasmine Lodge if I ever have another chance. 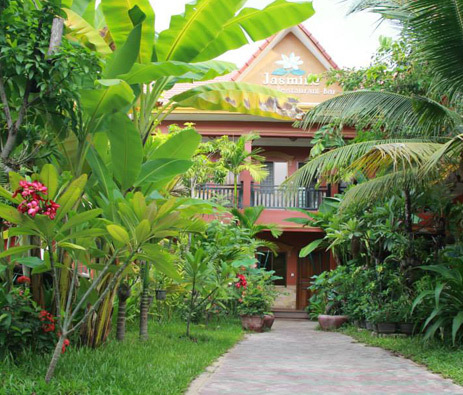 We have our vacation in Cambodia and so luckily to stay in Jasmine Lodge from 19-22 May 2010. I would strongly recommend and praise for the friendly service. 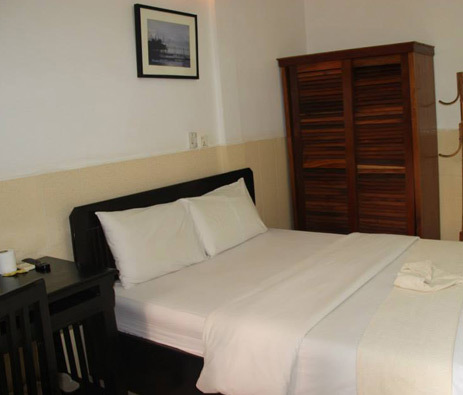 The room is clean, well maintain with the necessary facilities. The dinner serving is delicious. I like the most for the breakfast is tomato cheese bread, it is so yummyâ€¦ Although it is a short trip, I am very glad to know all of you and thanks for the sharing of your country's history and culture. I am definitely will come back again, keep it up! 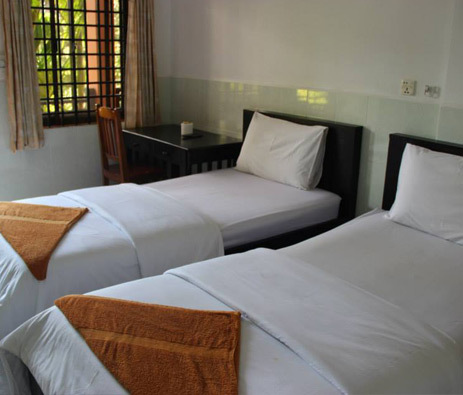 Room is big and very clean, staff are very friendly and helpful. Location is good, very convenient place.I like the breakfast of scramble egg, so delicious. Thank Mr. Kunn very much for the arrangement of the chocolate birthday cake for me to celebrate my friend's birthday! I will definitely come back again!